Avenir Telecom, under an exclusive Energizer licence, are set to release a new Ultimate range of smartphones. The three new smartphones offer enhanced design, an enriched photo experience, and long-lasting performance, with the the Ultimate U620S boasting four cameras, including a 16MP + 2MP + 0.2MP triple sensors on the back and a 16 MP front camera. Marseille, France, 31 January 2019 – Avenir Telecom, under exclusive Energizer® licence, presents an advanced preview of its new Ultimate range of smartphones, which are set to be introduced officially at MWC19. Enhanced design, an enriched photo experience, and long-lasting performance are just some of the attributes of this new series from Energizer® Mobile. The Ultimate smartphones feature cameras offering advanced functions that guarantee images of exceptional quality and enable both novices and experienced photographers to express their creativity. Among the new phones, the Ultimate U620S boasts four cameras, including a 16MP + 2MP + 0.2MP triple sensors on the back and a 16 MP front camera. Just a single click produces photos that are bright, clear and sharp. The U570S and the U650S are equipped with double rear 16 MP + 2 MP lenses offering Live Focus, Filters, Panorama and Beauty Face modes together with a 16 MP front camera. “Nothing outlasts Energizer® Ultimate Lithium™ AA batteries.” This is the motto of the Energizer® Ultimate Lithium™ batteries, which were recently named the longest lasting AA batteries in the world by Guinness World Records™. 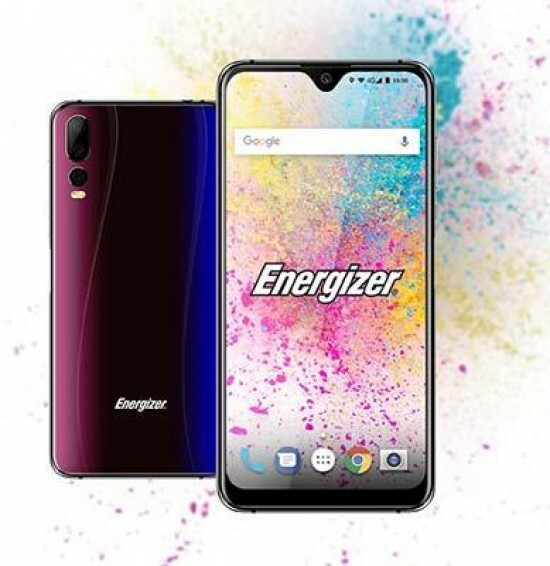 The new range of Energizer® Ultimate phones embodies this same spirit of performance and durability, with the different models equipped with batteries ranging from 3,000 mAh to 4,000 mAh to enable several hours of use. The phones can also be charged at high speed via their USB-C ports for even greater freedom and flexibility. With 4 GB RAM, large storage capacity ranging from 32 GB to 128 GB, and the highest-performing MediaTek processors, the Ultimate range of smartphones offer the power necessary for intensive daily use. Playing games for hours at a time, multitasking and watching videos in 4K quality is completely smooth, and made simple with the Android 9.0 Pie interface. The smartphones come in a variety of new shades, with options such as iridescent violet, aquamarine and turquoise to choose from. These brilliant gleaming colours are produced by superimposing different layers of varnish that capture the light and reflect it in a gradation of subtle and attractive colours. The name of these new smartphones comes from the size of each of their respective screens, a component where Energizer® Mobile has focused on achieving high quality, as each of the phones features a HD+ screen. The front camera on each phone, positioned centrally and elegantly highlighted by a teardrop shaped notch, gives way to a wide panoramic screen. The 18:9 and 18.5:9 formats of the phones make them easy and comfortable to hold and ensure content is displayed at optimal quality. These ratios, which enhance user comfort, will be particularly appreciated by gamers as they offer a completely immersive gameplay experience. To enrich the user experience, all models in the range offer innovative features that visitors will be able to discover and explore on stand Congress Square CS 96 at the Barcelona Mobile World Congress from the 25 to the 28 February 2019.